BUFFALO — It was supposed to be Buffalo Sabres rookie forward Jack Eichel’s party, but the Ottawa Senators had other ideas. Eichel, the No. 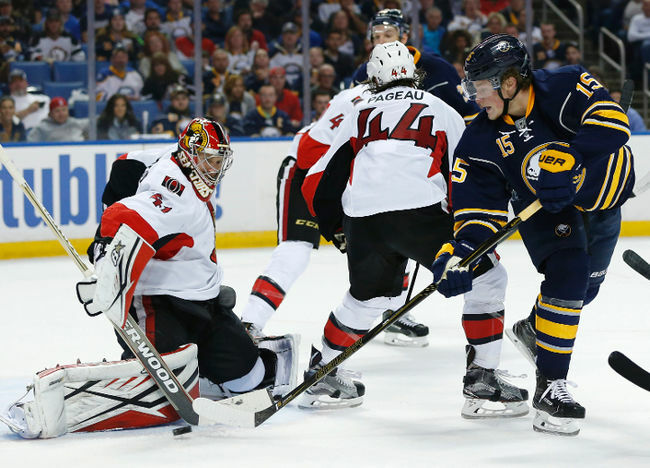 2 pick in the 2015 NHL Draft, scored in his NHL debut, but Kyle Turris scored twice and helped the Senators to a 3-1 win against the Sabres at First Niagara Center on Thursday. Turris gave the Senators a 1-0 lead 30 seconds into the game when he beat Sabres goalie Robin Lehner with a wrist shot over his glove hand. Senators forward Mike Hoffman carried the puck into the Sabres zone and got behind Buffalo defenseman Cody Franson when he connected with Turris, who was alone in the slot as he skated to the net. Sabres forward Ryan O’Reilly tried to get back to cover Turris but didn’t catch him before Turris’ shot got past Lehner. Turris gave the Senators a 2-0 lead with 9:11 left in the second period. Forward Mark Stone intercepted a puck behind the net from Sabres defenseman Rasmus Ristolainen and passed out front to Hoffman. Hoffman’s shot was blocked by Sabres forward David Legwand and the loose puck went to Turris, who shot it past Sabres goalie Chad Johnson. Stone and Hoffman assisted on each of Turris’ goals. Johnson replaced starting goalie Robin Lehner with 12:30 left in the second period after Lehner sustained a lower-body injury. Lehner apparently was injured when he dropped to his knees to stop a shot from Stone, and stopped all 11 shots he faced after Turris’ first goal. Lehner was seen leaving the arena on crutches with a boot on his right foot. Eichel scored on a power play 9:11 into the third period. With Senators defenseman Patrick Wiercioch in the penalty box for hooking, Sabres forward Marcus Foligno passed to Eichel in the faceoff circle, where he took a wrist shot that beat Senators goalie Craig Anderson over his shoulder to make it 2-1. Eichel scored two goals and had four assists during the preseason. “Great shot. … It was on my left side, glove side, and I saw [Foligno] pass it across,” Anderson said. “There was nobody out front so I assumed he was coming from behind the net. I got over there and thought I was pretty square, I was probably still not 100 percent square to him, and [Eichel] made a great shot just underneath the bar. Evander Kane nearly tied the game 1:23 later when he jammed the puck past Anderson on the near post, but Cameron challenged the call saying the Sabres were offside. After reviewing all available replays and consulting with NHL Hockey Operations staff, the linesman determined Zemgus Girgensons was offside prior to the goal. Senators forward Curtis Lazar scored an empty-net goal with 1:04 left.